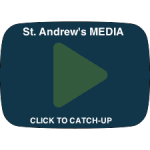 Welcome to St. Andrew’s Church’s Media page. We now record and stream our Sunday morning services LIVE every week so you can watch at 11am or catch up on a previous week’s service by clicking one of the icons below. We will also be streaming our special services at various times throughout the year. You can now also view all our recorded services via our YouTube channel or by clicking the icon below. We would appreciate your feedback, to do so please click here to contact us. If you have any difficulties using any of these services please contact us and we will help the best we can.